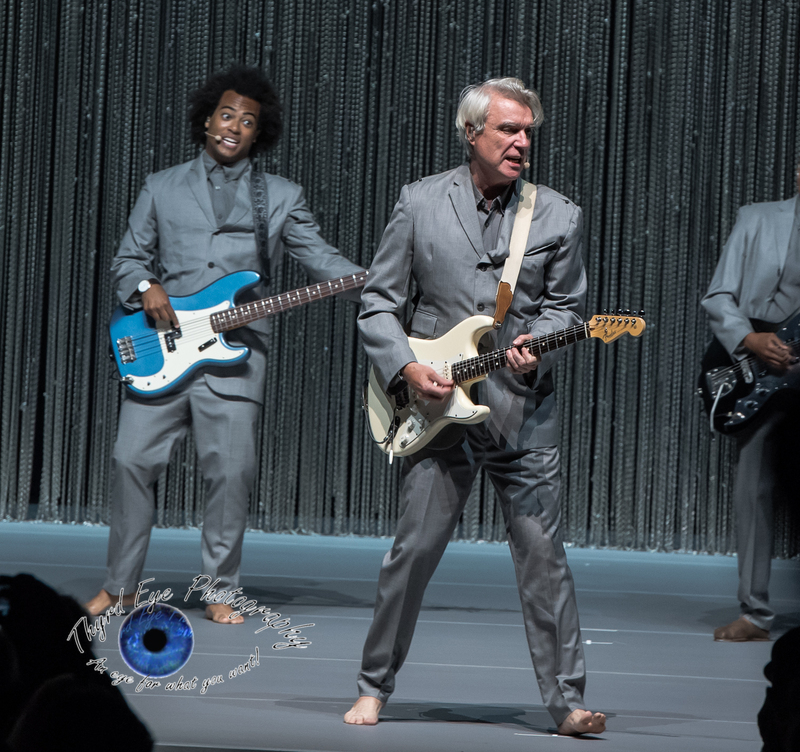 David Byrne performing at Peabody Opera House in Saint Louis Friday. Photo by Sean Derrick/Thyrd Eye Photography. 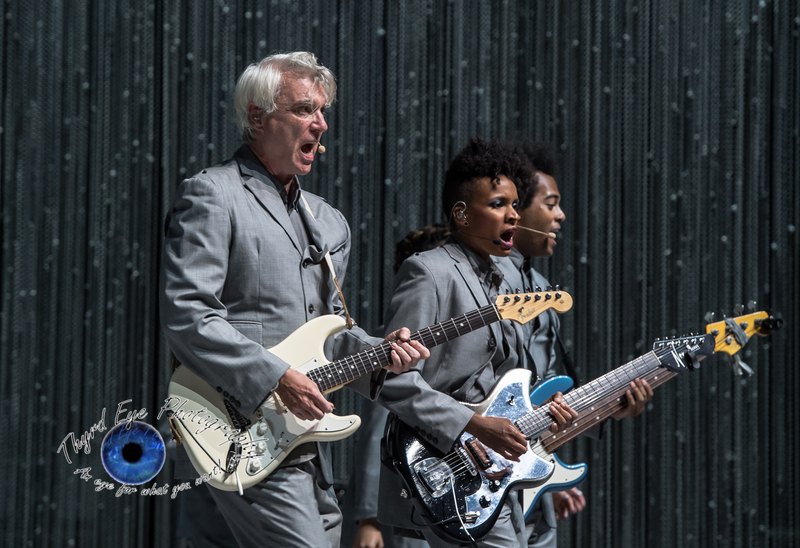 David Byrne, one of the most artistically acclaimed performers in music, made a visit to Saint Louis with a sold-out performance at Peabody Opera House on Friday, and did not disappoint. Working with minimal lighting and no props Byrne displayed masterfully that sometimes less is more. With no flashy moving light trusses, no lasers, no pyrotechnics, no video screens…you get the picture, Byrne only utilized a wall of chain link hanging from a truss on three sides that was raised during the first song. 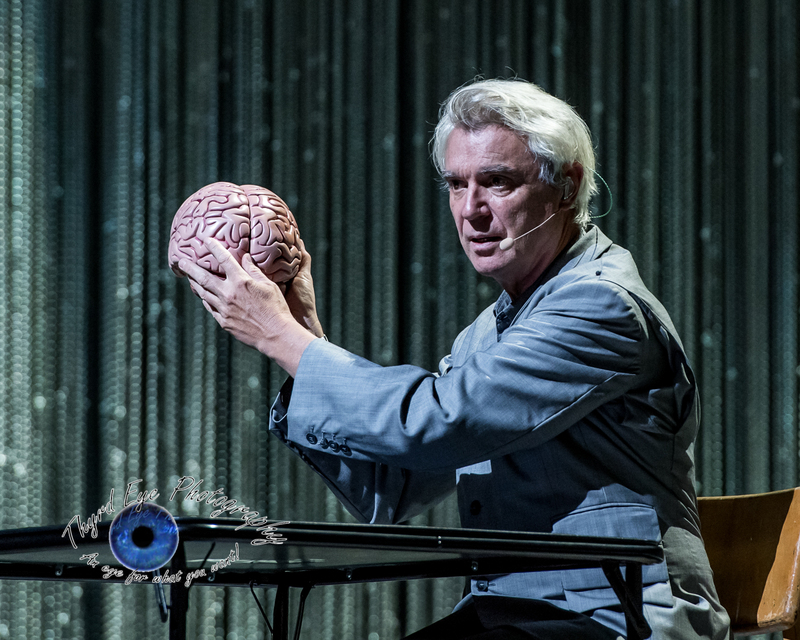 Set only with a base of color changing light draping down the curtain, providing mood lighting and setting the tone for the show Byrne sat alone on stage at a table holding one of the few props he would utilize throughout the night, a brain, as he performed “Here”, the last track from his most recent album American Utopia. 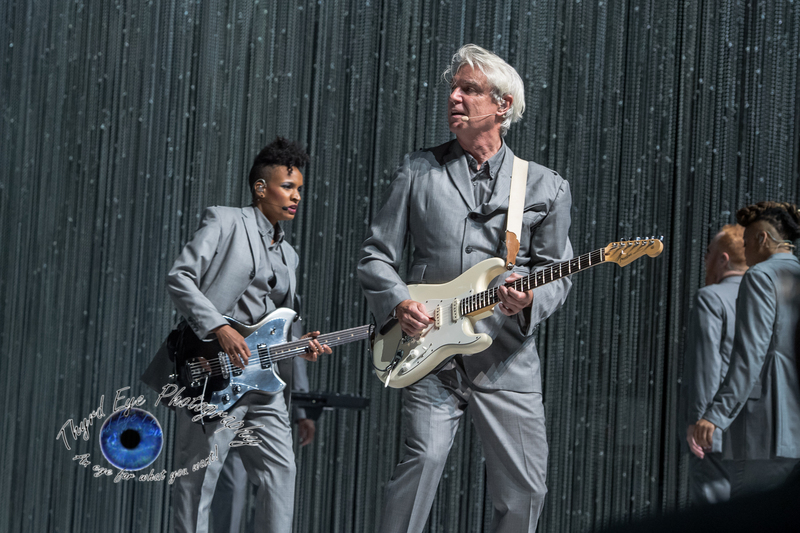 Two dancers/backing vocalists came onstage followed one by one by nine musicians, each barefoot just like Byrne, and wearing similar grey suits. By the time the second song, “Lazy” came on the entire Peabody Opera House was up on their feet dancing, though some clearly better than others. That the fans were up for the rest of the set having fun and entranced by the visuals given by Byrne and his band (none of which sat down the entire show, yes even the drummers were part of the visual) spoke volumes to the effect Byrnes has on his fans. The dancing was infectious as it was difficult to resist the urge, with the worldwide exotic influences on the music blending funk, new wave, infectious bass and drum-based performances, and pop leading the way. The lighting, oh the lighting. Apart from the single spotlights from behind up above each individual performer and the curtain lights there were no other lights (not counting the front spotlights, of course). Byrne probably had more gear in the sound system than on the lights, and it was a very good thing. Byrne is a true artist in every sense of the word and his use of deep shadows and light positioning was fantastic. 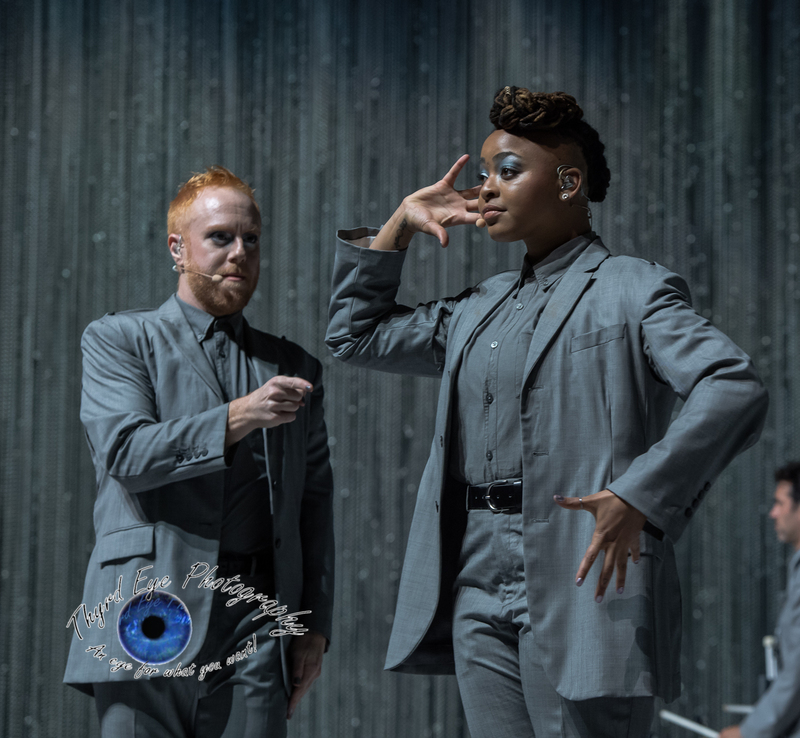 For the song “Bullet” the only lighting was a single bulb rolled in on a stand in the middle of the stage as the musicians and dancers walked slowly around Byrne and the light the effect cast moving human shadows around the Peabody Opera House. 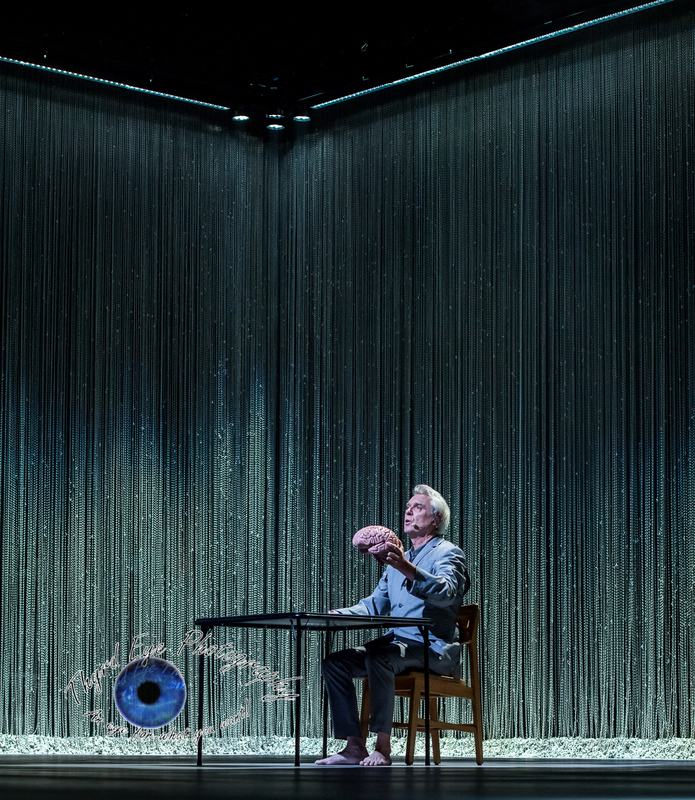 One of the most impressive visuals came during the Talking Head’s song “Blind” where a single spotlight was placed at the front of the stage pointed back at Byrne and his band. 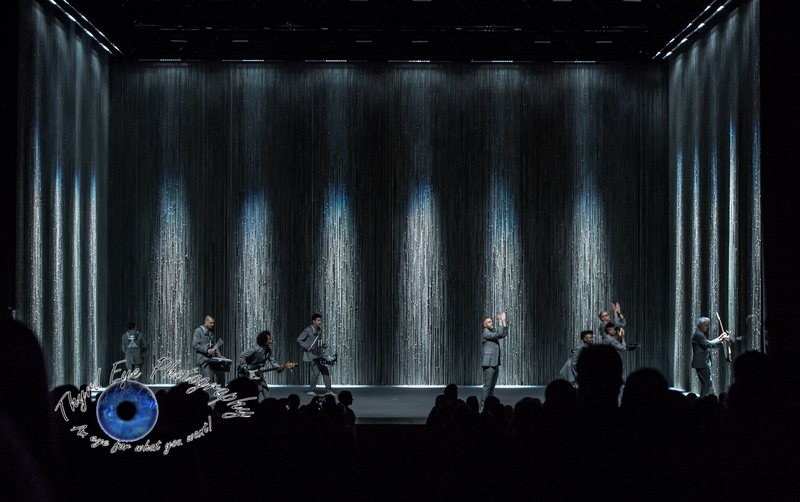 The resulting effect created larger than life shadows on the back curtain with Byrne towering above the rest, joined by different members as they approached the front of the stage, but all creating a unique and stunning visual. Of course, even thought the lighting played a major part of the show and was the visual emphasis the music was the catalyst that drove the show. Byrne has always been a very active performer and Friday was no different, with Byrne constantly on the move throughout the show. His voice was superb, and his stylings were fitting with the artistic direction the show was presenting. His band was spot on and extremely tight both musically and visually as their choreographed moves at times resembled a Broadway musical. Several highlights stood out during the show, most notably the ending song in the main set, the Talking Heads’ classic “Burning Down the House”. Byrne strapped on a fire red acoustic guitar for the performance which fit well with the deep red lighting on the stage. After a two-song encore Byrne emerged for a second encore to perform an updated version of Janelle Monae’s “Hell You Talmbout”. It was a truly fitting end to a classic performance from a classically artistic performer who hasn’t lost a step. 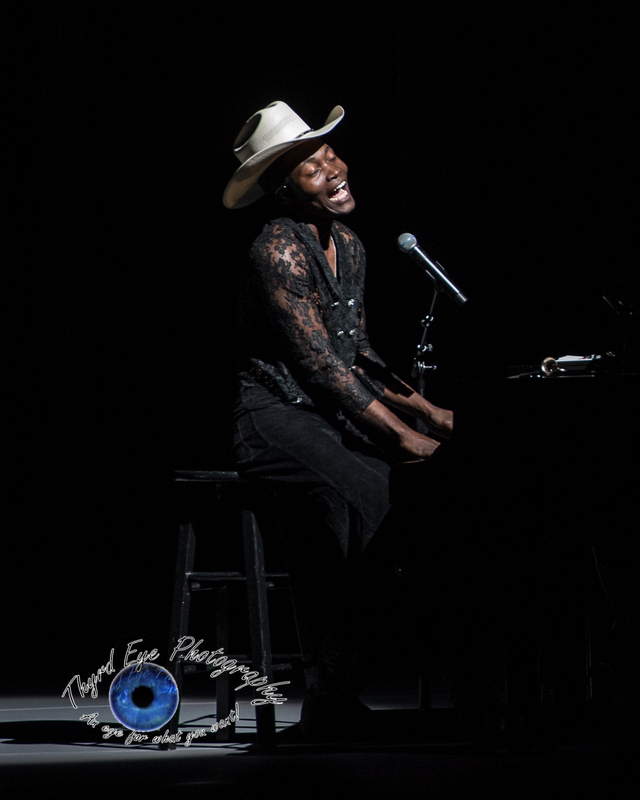 Benjamin Clementine performing at Peabody Opera House in Saint Louis Friday. Photo by Sean Derrick/Thyrd Eye Photography. Benjamin Clementine opened the show with an avant-garde performance that fits well with the David Byrne artistic vision. Check out the gallery below for more images from the show.